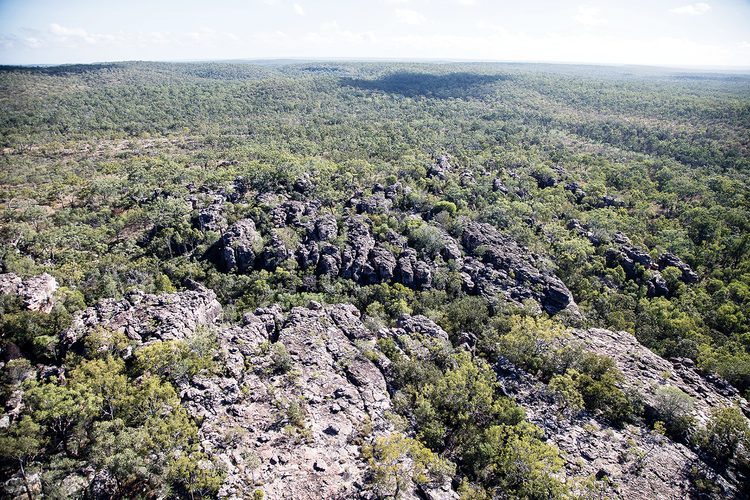 The Mimal Land Management area is located in the heartland of Arnhem Land in the Northern Territory. It’s teeming with plants and animals and home to sites of great cultural significance. Bulman and Weemol are the main communities operating in the area. Two decades ago there were seven occupied outstations, but today the only permanently occupied one is Mt Catt. Governments no longer see people living on their country in the positive way they once did. Our area is rich with a vast array of plants and animals inhabiting a wide variety of ecosystems – some species are only found here. It is also home to important ancestral and cultural sites, there are some special places for ceremony and other places people cannot visit. Ruwurrno (Dalabon) and Rorrobo (Rembarrnga) makes up a fairly small part of our country but it is very important and needs looking after to keep it healthy. Plains country is grass country, so we focus on having healthy native grasses. Balanda grasses and weeds can destroy our plains country. Plains country is good for cattle and we don’t think they’re doing too much damage, but overgrazing on some red soil hills is causing loss of important grass cover and scalding that leads to erosion. If the grasses and shrubs are in good health then we should find plenty of fat turkey and emu in this area. When little plants like all the different bush potatoes are not being wiped out by pigs, there will be plenty of wulala (kangaroo) and brolgas. We should find plenty of grassland bush rats and pythons. Bluetongue should also be there along with fat plains goannas. Feral cats are doing well on the ruwurrno and are killing lots of our small mammals and reptiles. Cane toads have just about wiped goanna out. It makes us sad about losing tucker but also upset because this is an important animal for ceremony. GOAL: By 2027 the downward trend of health for the grassy plains will have been reversed through strategies to address overgrazing, reduce damage by pigs and feral cats, prevent grassy weed invasion, and ensure continued healthy country fire management. We have different kinds of woodland, the tall forests and the dry low woodland each have their own special plants and animals that need us to keep this country healthy if they are to survive and to breed. Water runs through our woodland country but it isn’t flooded every year like the land along our rivers and creeks. In some places there is very little water in the dry season. When the right trees are flowering, sugarbag are filling up their nests. When the right grasses are there, kangaroos are getting fat, emus and people are finding the right fruits. 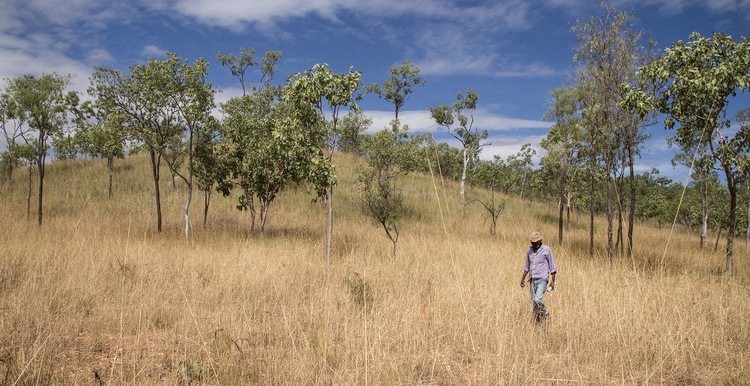 Our woodlands are free of grassy weeds like gamba grass – but we need to be careful to make sure it does not come to our country. Our strongest tool to manage our forest and woodland country is fire. If we burn country in the right way, with plenty of early burning to stop late season wildfire, we will keep this country healthy. GOAL: By 2027 continued good fire management, effective weed control and implementation of changed herd management focused on buffalo, horses, donkeys and cattle will see good health maintained. Old people once lived in the rock country and knew everything about it, but visiting and managing rock country is difficult for landowners and rangers. The wet season blocks road access, and in the dry, much of the rock country is too rough for vehicles. We have to invest a lot of resources to know if this country is healthy. Are there still nabarlek in the rocks? Rock country grass wrens? Rock pigeons? Black wallaroos and kalkberd? Rock possums? If we find plenty of the right animals we will know country is healthy. Fire is the best tool to keep this country healthy. 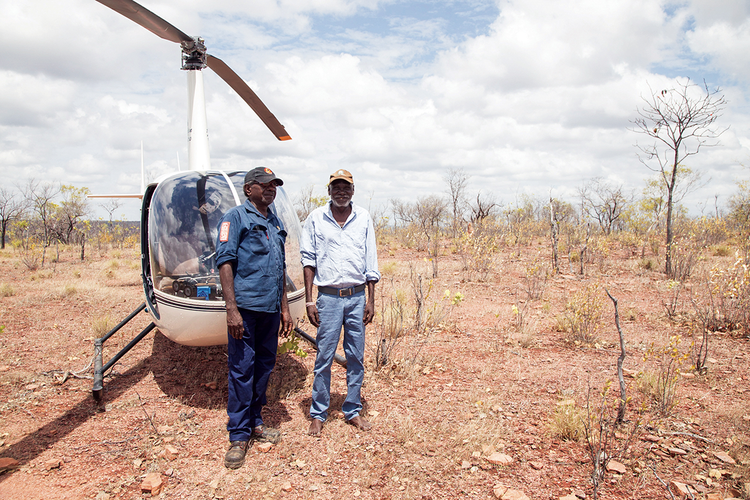 Helicopters allow our rangers to deliver early burning to protect the plants and animals. Early burning for rock country plants that can’t survive repeated late hot fires is really important. Camera trapping and other survey work will give us much of the information we need to better manage the animals and plants in the rock country. We also need to rediscover and look after our rock art and make sure the burials of old people are cared for and respected. 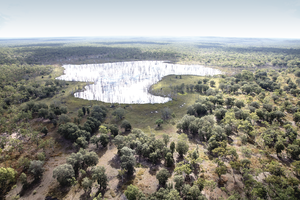 Rangers, landowners and djungkayi work together to look after this area. Our rangers are working toward managing the information about country and rock art on Mimal’s information management system. GOAL: By 2027 landowners and rangers will have greater access to rock country and there will be a successful and ongoing program of documenting and conserving rock art. The specific fire regime that the rock country ecological communities require will be delivered at finer spatial scales and weed incursion will be better controlled. Our freshwater country is for families. This is where we go to get fish, turtle, lily roots, mussels and yabbies. It’s where we find ducks and geese and sometimes catch sawfish that come all the way up from the saltwater. In healthy wah and djula country, the water is clean and clear, it smells and tastes good. But we don’t think this country is very healthy. In many places the water is dirty and stinking and not right to drink. Chemicals from dead animals are turning the water green. Cane toads are everywhere. 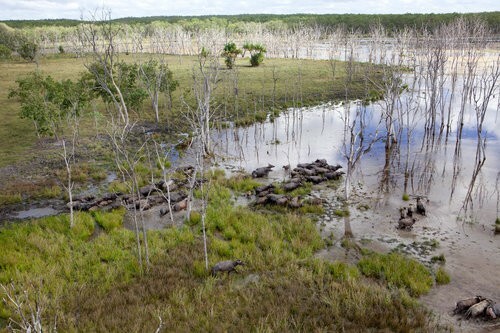 And there are too many cheeky buffalo and pigs. Some people are frightened to camp on country because of this. In some places, like Weemol Spring weeds are a big problem. 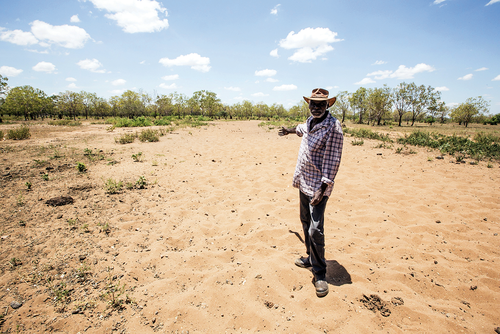 Mimal has started a three-year project to develop ways to manage and begin looking after djula and wah country across the area. GOAL: By 2027 a program of two-way monitoring of freshwater country health will demonstrate improved habitat for native species, better access for landowners and community members, who will again feel safe spending family time hunting and fishing in freshwater country. We have many kinds of special places. Some are where we feel close to our old people who lived there for thousands of years. There are places that have strong meaning for families for hunting, camping and taking their children to get that special feeling for country. These are our places and people who are not connected to that country should always ask and show respect for the landowners and their djungkayi. We have sacred places. Some that only men who have gone through ceremony can visit. Some are places special for women. Others are open for men, women and children to visit with proper respect and feel the presence of the spirit ancestors. 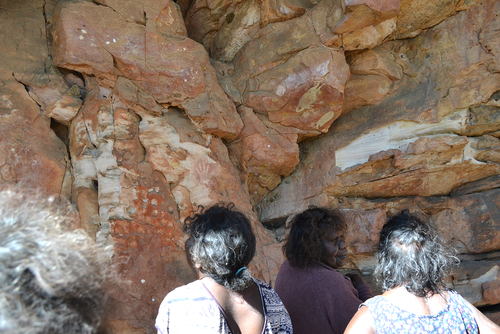 We have places with rock art that is sacred and restricted as well as rock art that everyone can look at. We also have places where our old people are buried — in our communities and also in the rock country. Old people used to have places where they would go to talk to the country and make more animals breed up and fill the country. This cultural practice and knowledge of our special places has been lost. Landowners and djungkayi work with Mimal and our rangers to help protect our special places and the knowledge that goes with them. Rangers can watch out for wrong people going onto special places — balanda pig shooters, tourists and even balanda who work in our communities who don’t understand the importance of always asking and showing respect. GOAL: In 2027 sacred places will be actively protected, illegal access controlled and families will have improved access to their special places, which will be safe and clean.